If there is one pitcher in baseball glad to see the calendar change it is Burnett (6-7, 5.25 ERA). For the month of June he was 0-5, with gargantuan 11.34 ERA. If you caught any of his pitched games, this is a hurler really struggling mentally. Of the 35 hits he allowed last month, 11 of them went over the wall. 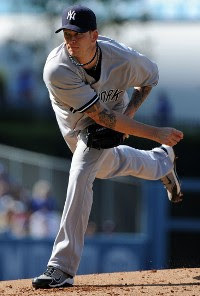 Burnett and the Yankees hope he turns around this month around quickly. The Colorado pitcher is finding his groove after a rocky start (intentional play on words), lowering his ERA to 4.69. Cook (2-5) pitches to contact and his fastball has had more sink in the last several starts and if the Rockies are going to make run at NL West crown, they will need Cook to be cookin’. De La Rosa has been out since April 25 with torn tendon band in the middle finger of his throwing hand. He’s at Triple-A Colorado Springs working to get to big club. He’s still only 26-years old, but the lefthander just hasn’t risen to the same level of excellence he achieved during the 2008 postseason. His 54-40 career record shows too many cement-mixer curve balls and change-ups left up in the zone. The Phillies bats have been quieter this season and Hamels (4.08) has to be better than 6-6 this season. Throwing for Arizona is not a comfortable position for starting pitcher. As a starter you fill like you have to throw a complete game since they have combustible bullpen. This has caused Haren (7-6, 4.56) to attempt to be too fine and he touched for 19 home runs and .282 batting average compared to career number of .253. Interesting to follow if he can retain July’s previous good fortune. Johnson (8-3, 1.83) hasn’t given up three earned runs in a game since May 8, which covers nine starts. At 6’7, 250-pounds, he’s imposing figure and his mid-to-high 90’s heat jumps late, causing bad swings and misses. With the way the Marlins ace is throwing, he could be in for special month. Lackey is a Texas native and heats up like the weather when it comes to wins and losses. He’s no longer the hard thrower that can go thru a line-up more than twice without making adjustments on the run. His 9-3 record is mixed with good fortune as his 4.46 ERA is run of the mill. In Lackey’s last seven starts, Boston has averaged 8.1 runs per game. The left-hander continues to quietly keep rising in the elite ranks of pitchers in baseball. His 51-19 career mark is among the best since 2006 and this season he been even more impressive with 9-3 record and 2.86 ERA. Opposing batters are hitting a mere .205 against him. At 37, Lowe (9-6. 4.53) is no longer the pitcher worms used to fear, with opponents incessantly beating the ball into the ground for outs. The vast majority of outs Lowe still induces are still ground balls, but his command has been a little iffier in 2010, presently heading towards a career high in free passes. If he finds the groove, he and Atlanta should have another strong month. Oswalt (3.55) is heading towards his first losing season with 5-10 record playing for an inferior Houston club. Trade rumors abound for the 32-year pitcher, who would appreciate a change of scenery to recharge the competitive juices. If a team is interested in Oswalt, it should make a move now based on July figures. Manager Mike Scioscia is known for his great patience in understanding the season is 162 games long and players are going to have ups and downs. Joe Saunders (6-8, 4.88) has been testing Scioscia’s resolve with a rollercoaster campaign. Saunders has been far more effective on the road (3.35 ERA vs. 6.18 at the Big A) and if he straightens out that part of game and pitches inside to RH hitters, he should have typical July. After a VERY choppy beginning, Vazquez (6-6, 5.16) is becoming the type of hurler GM Brian Cashman was hoping for. Vazquez has 3.78 ERA in last 10 starts and has better than 2-to-1 strikeout to walk ratio. Last year’s Cy Young winner has had a rough go of it this season, with a combination of Kansas City bullpen failings and Greinke (3-8, 3.72) trying to do too much. He’s been sharper of late and might improve on this month’s historical record with a little support. On the DL with gluteal strain and is scheduled for a few bullpen sessions to start the month. Strictly a back of the rotation guy, Parra (2-5, 4.12) was returned to the Milwaukee rotation after they had nowhere else to turn to. His 3.98 ERA as starter isn’t all that bad, however this southpaw is being crushed by lefty hitters, conceding .380 BA. The Giants fifth starter has been on the DL since June 11 and according to team reports is expected to return to club in mid-July.